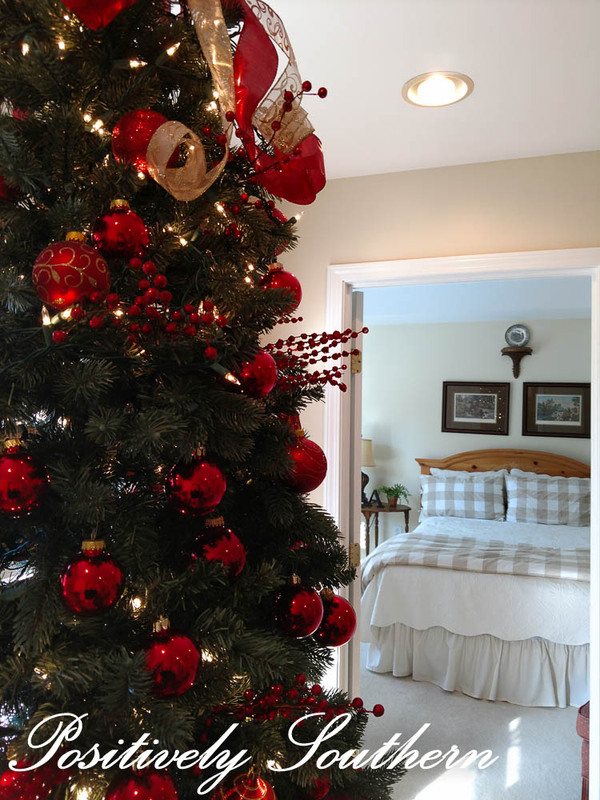 This year I opted to not have red in the main Christmas decor and I have to say I have missed it. 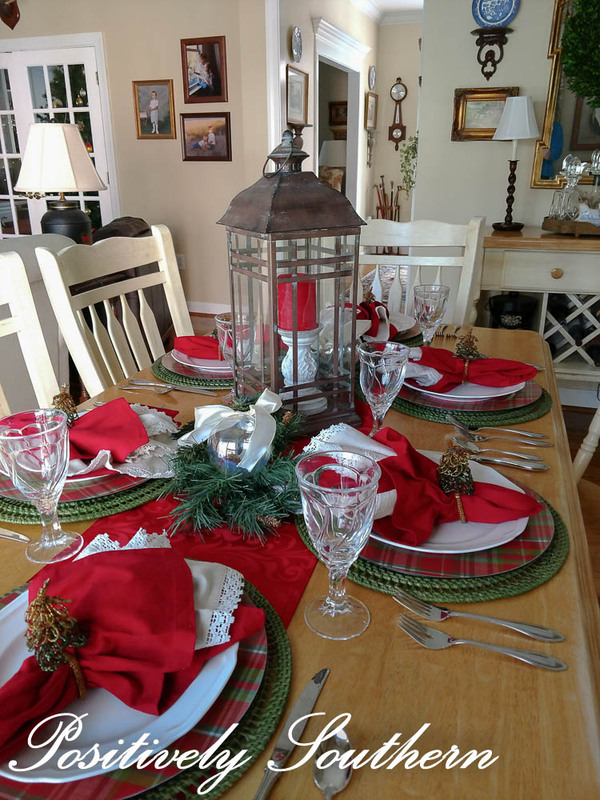 The Christmas Eve table just seemed to fit the bill for red. 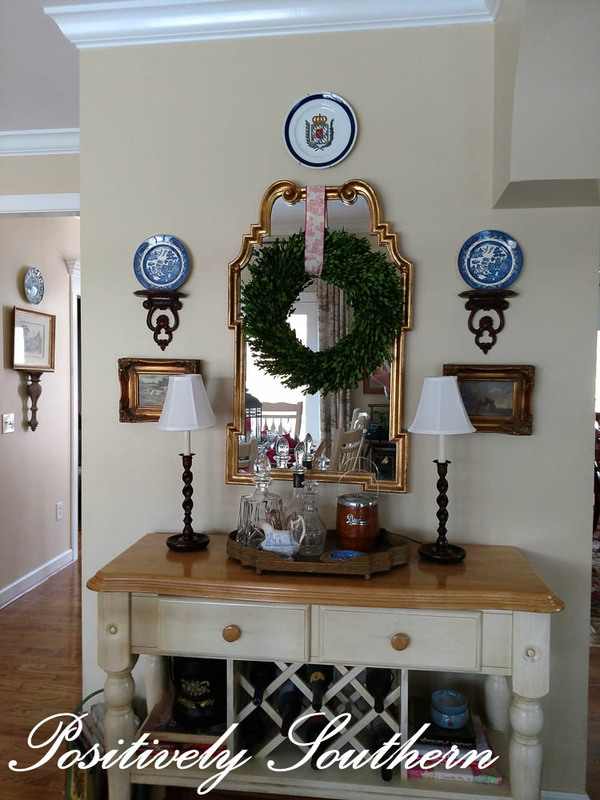 The lantern is from Pier 1, it is one of my all time fav ones. It has certainly gotten a work out this year as I've kept it on rotation this entire holiday season. 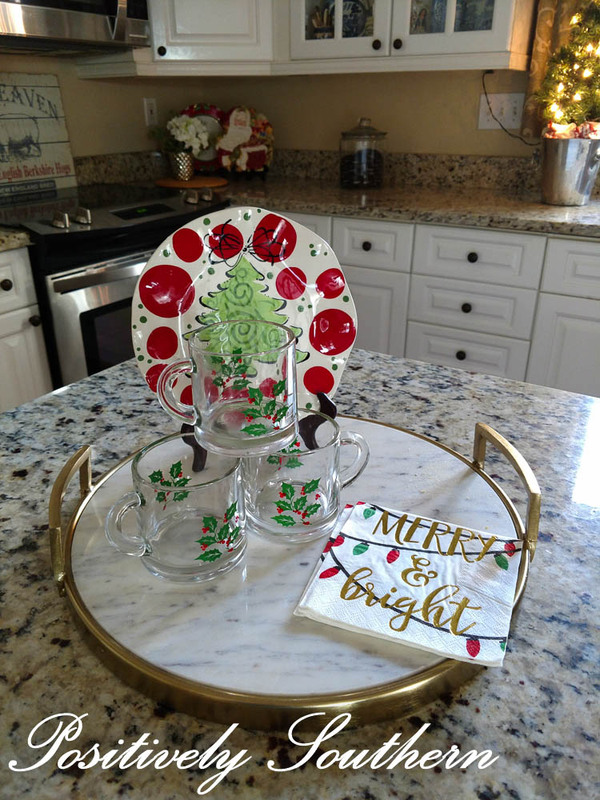 My dear Mother in law gifted me the Christmas china over several years. I love pulling these out each year and serving our family meal. The captain's place setting is just a bit different than the others. Using a gold place mat makes the red charger pop. 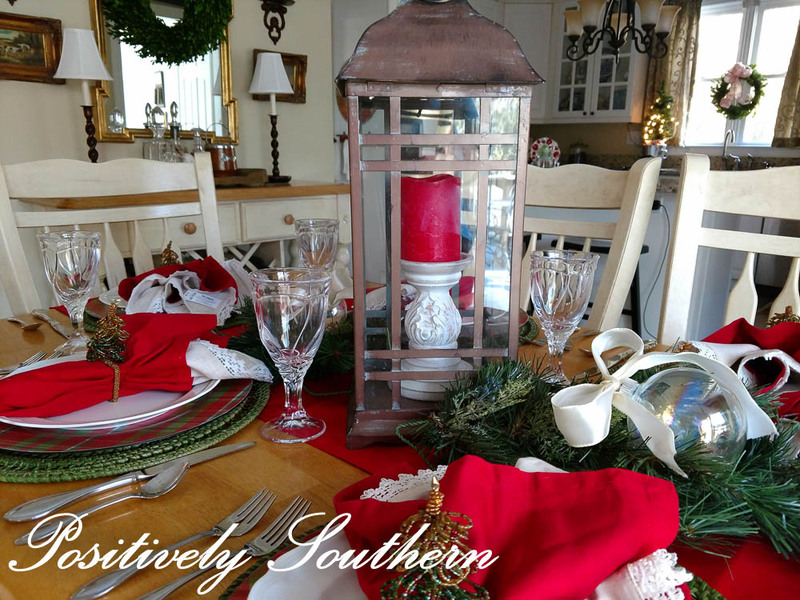 As I write this post I have absolutely no idea what I'll serve the family. 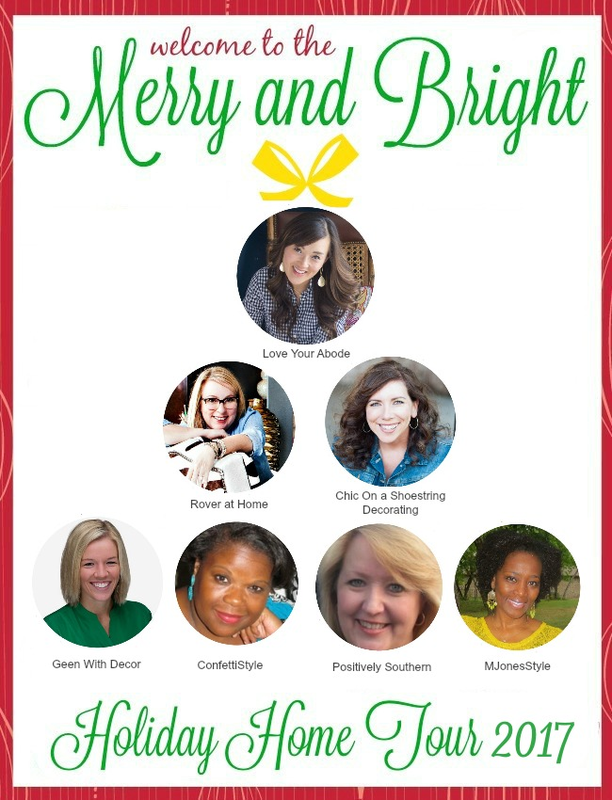 We will head to Christmas Eve services and then look at lights in our neighborhood...then home for dinner. What do you all do for Christmas eve? 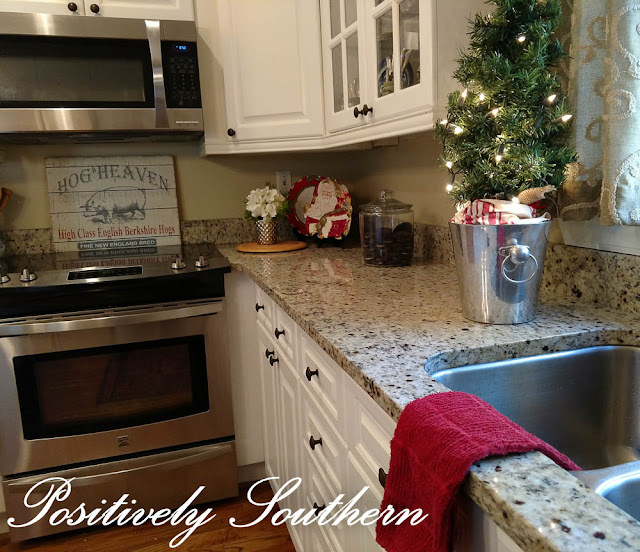 Well guys...here we are the final edition of the Merry and Bright Holiday Home Tour! I can hardly believe today is our last day, seems like we just got started! I'm glad you've checked in with us each week for the wonderful inspiration that everyone has shared. If you have stopped by from Confetti Style, I'm delighted to have you visit. There is so much more you can learn all about me right here. 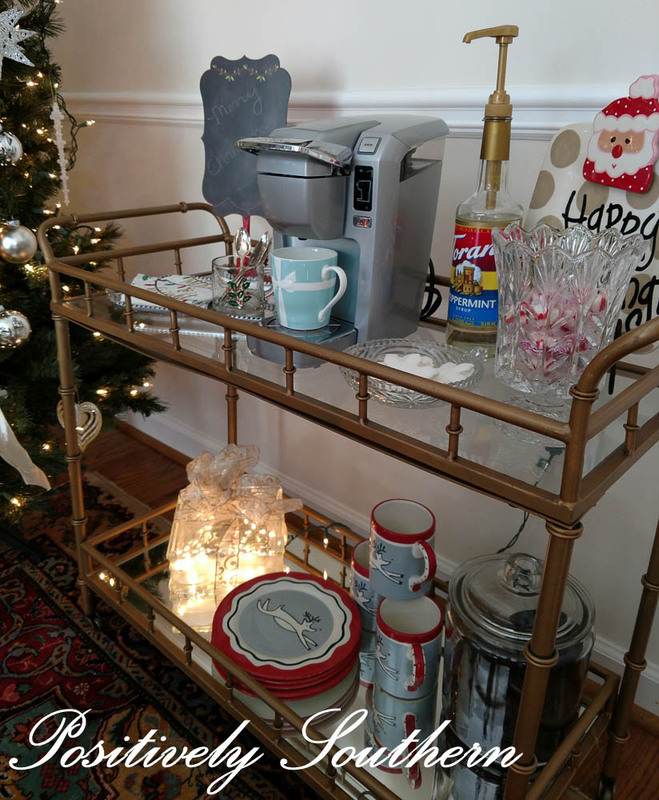 Today on our stop I'm sharing my holiday and most likely winter bar cart. 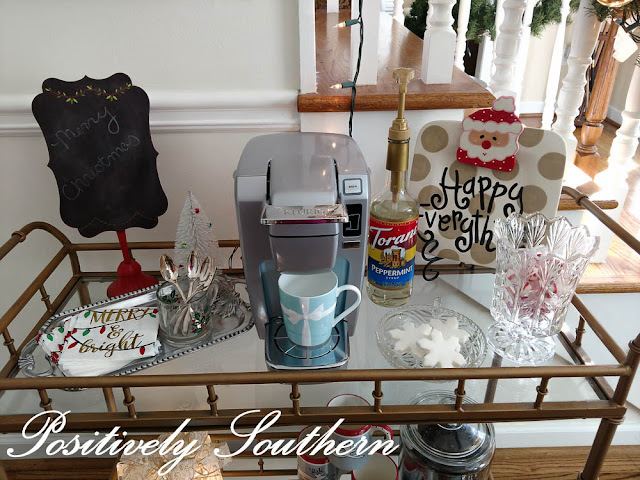 In years past I've had my coffee/hot chocolate station on the kitchen counter. This year when I found the bar cart of my dreams I knew I'd use it in a host of different ways and beverage station for winter was at the top of my list! 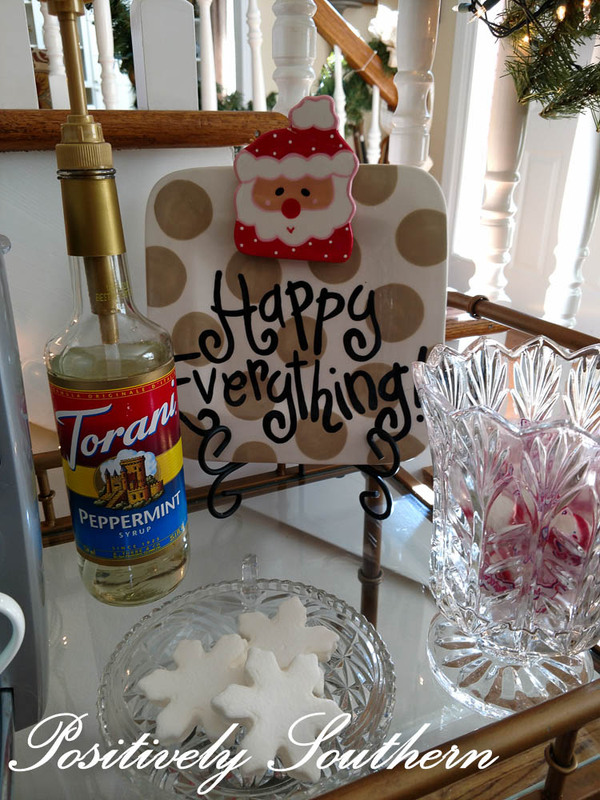 My Tiffany cup looks just perfect on the bar cart! I was gifted a pair from a very dear friend earlier this year. In this house we are crazy for all things peppermint. 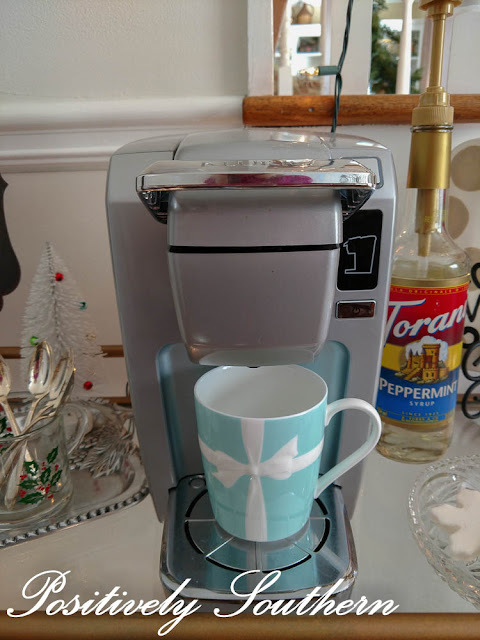 It is a mainstay for all warm beverages around this house. The boys love to dunk a cookie in their cocoa so I always have cookies and plates handy for a quick snack. I have just one more space I'm gonna share with ya'll. This is where all the red went for this year. 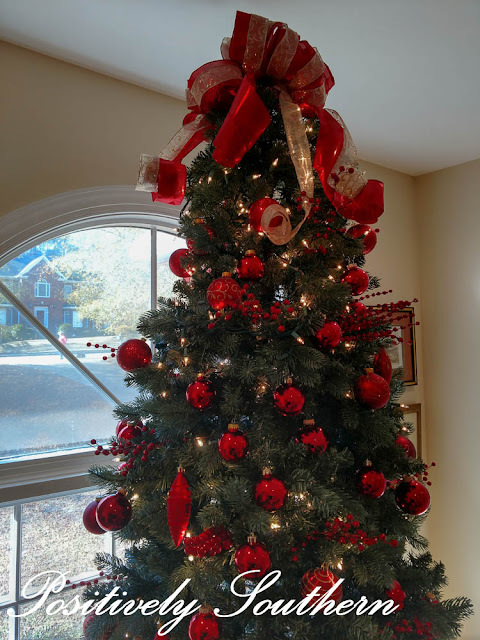 The entire tree is decorated in just red ornaments. This tree sits in front of the big window that is very much a focal point for the house. I 'd love to know what to call this space....I have struggled for 10 years what to refer to this area as. I think if I had known we were going to live here this long I'd have put bookshelves on the longer wall and called it the library! It is pretty much my equestrian space as it is heavy in horse decor! 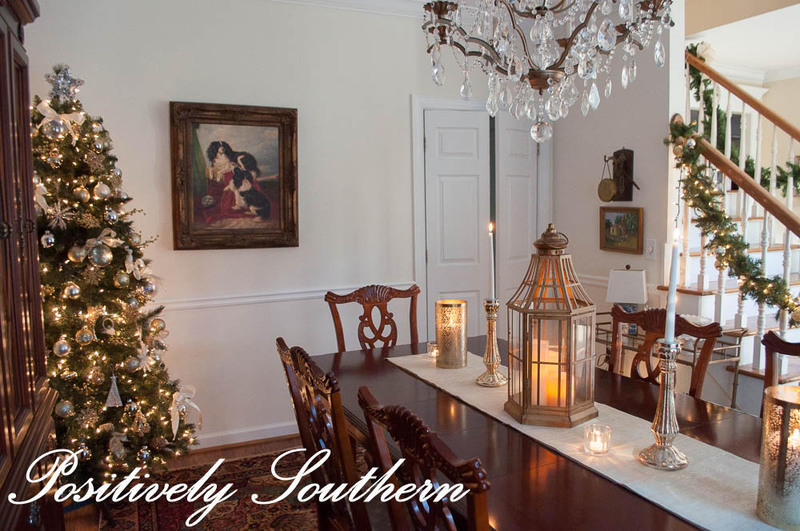 It has a been such a pleasure to have you follow along on this year's Merry and Bright Holiday Home Tour! The homes shared have surely been full of inspiration for me and I hope you as well! Next up on your tour today is MJones Style, I know she has something fabulous to share! Creating fun tablescapes has long been a hobby of mine. Since it is Christmas time and everyone is very careful about spending too much extra $$ I'd like to share how I used the same charger for both a very formal look and casual look. As soon as I saw these chargers in the Pier 1 planner in early fall I knew I'd have to have them. Initially, I'll admit that I only saw them with my everyday dishes. 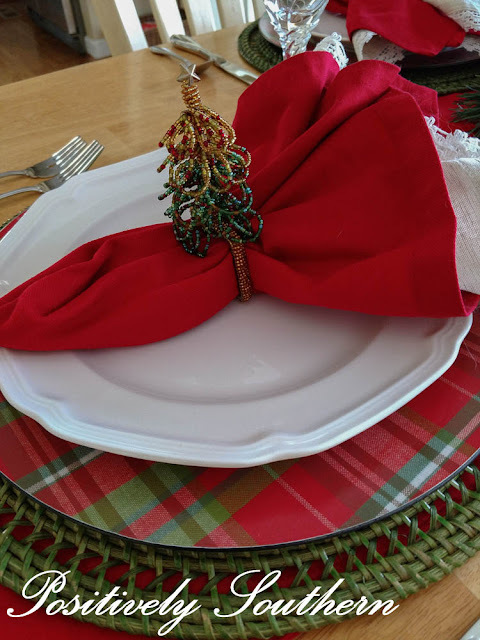 Once I got the plaid chargers home I happened to pull out my Christmas china and as they sat beside each other it hit me, maybe that was also an option. I'll start with the informal dishes. My everyday dishes are your basic creamy white in color. They go with everything! Also notice the green rattan charger, when I started working on this I didnt even recall these placemats. It wasn't until I went looking for my napkins that I saw those. Before I found these I was also looking at a simple round green placemat from Pier 1 that happens to be almost the same color. 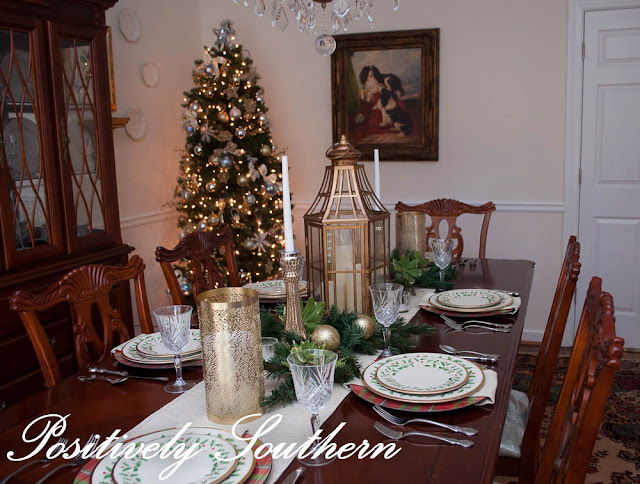 The same look could have been achieved with those round placemats! We are not huge entertainers until December rolls in. 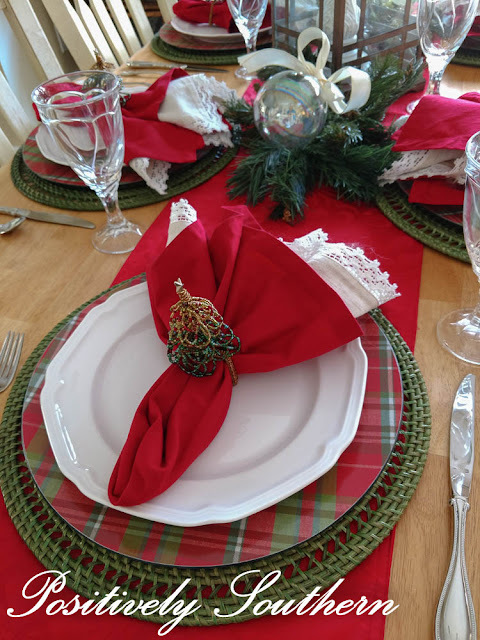 Since we have multiple dinners that often include the same yet different people, I want the table setting to be fresh and new each time. Now as a side note, this isn't the only table setting that I will be sharing the Christmas china in. 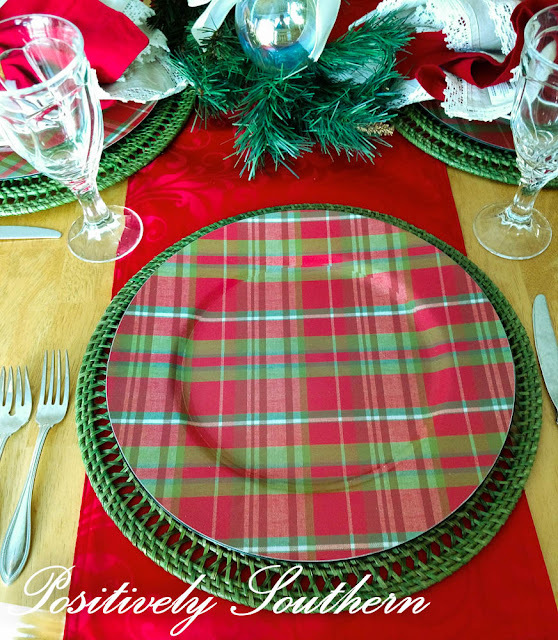 My initial concern was would the plaid be too casual to use my formal Christmas china with. The second I sat the dinner plate on the charger the answer was NO! Resting a very formal napkin with a gold thread, I placed the napkin vertically on the charger. It worked to soften both the charger and the plate. Along with adding softness, I believe it broke up the plaid just a bit. The colors of both the charger and the plates marry very well. All that was left for me to do was add a few others elements to the table. 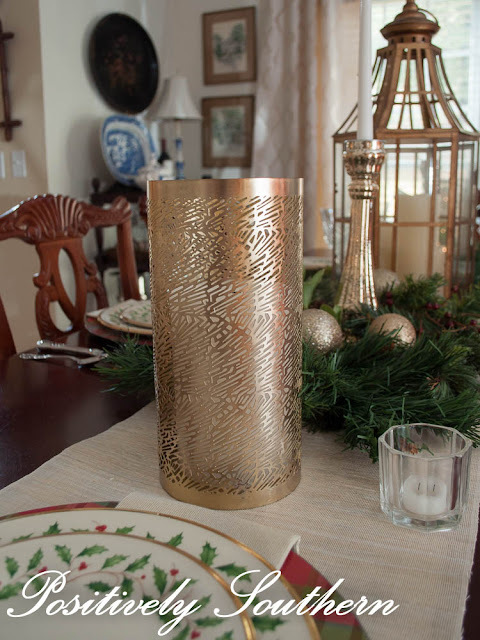 Fresh greenery from the yard along with the lantern, mercury glass taper holder and the gorgeous pair of pierced candle holders finish the table off. Using the same chargers absolutely saved me money and space(storage)while creating 2 very lovely table settings. I'd love to know ways you've used home decor in multiple ways to save! 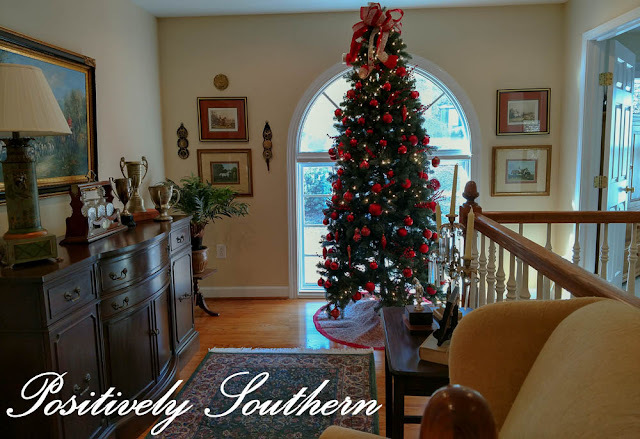 With the most anticipated time of the year upon us, here at Positively Southern we've decked the halls along with our dining and entertaining spaces and I'm thrilled to share those with you! If you've popped over from Love Your Abode I'm delighted to have you! You can get to know more about me here. 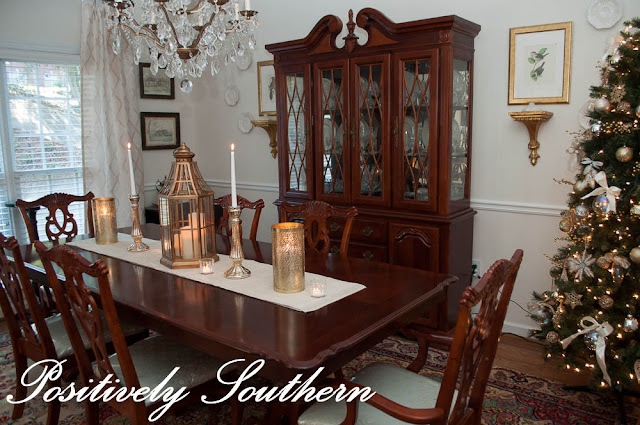 The dining room just might be my most fav room in our home. 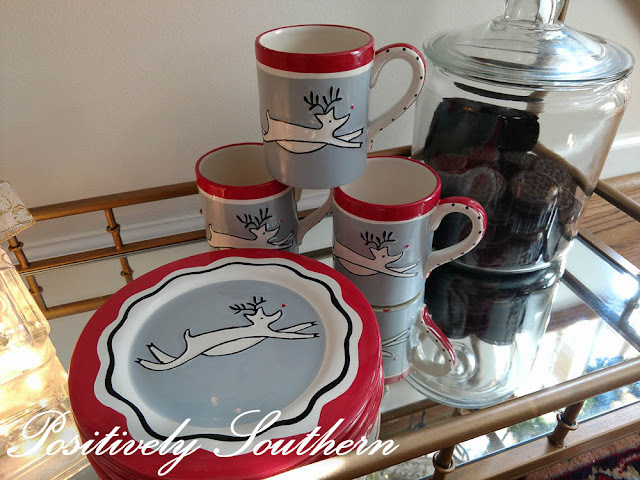 It has pieces I simply adore, Blue Willow dishes along with our wedding china to name a few. This year the color scheme I've selected has used gold, silver and ivory elements. I do admit that it has proved to be a challenge not using traditional Christmas colors....yet! The pierced candle holders were sponsored by Amara Living and a gorgeous addition to my Christmas decor. Expect to see these stick around all year long as I've long had an affection for anything pierced. 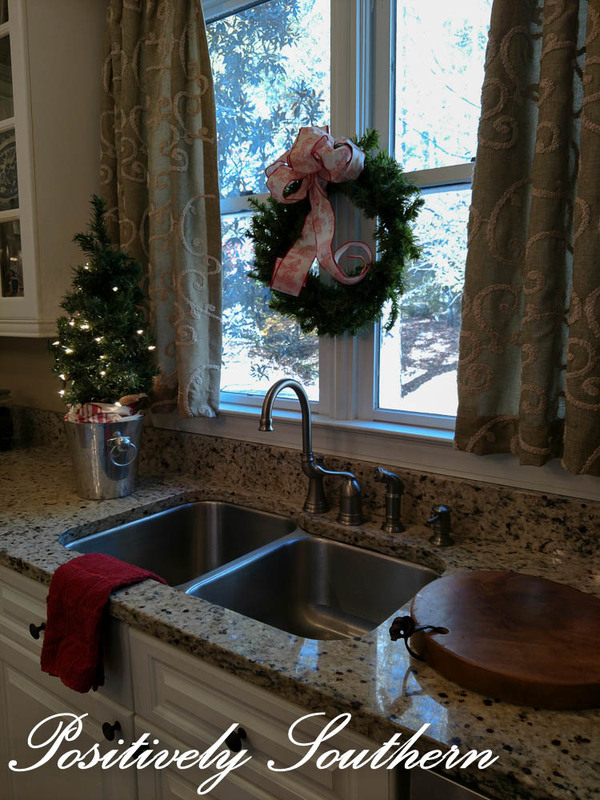 The kitchen is also spruced up for Christmas too. The kitchen along with the breakfast room are the only rooms downstairs that I've used red in. 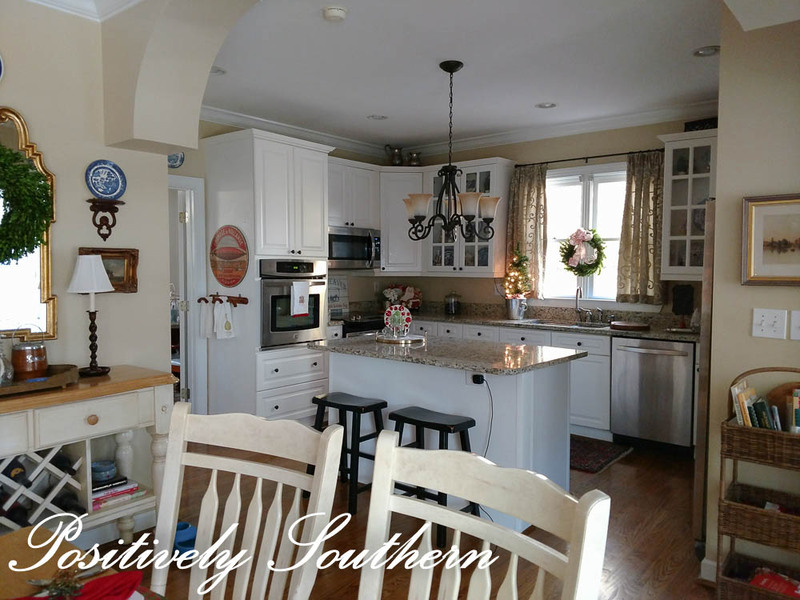 The kitchen buffet has long been a spot I've enjoyed decorating for any season. 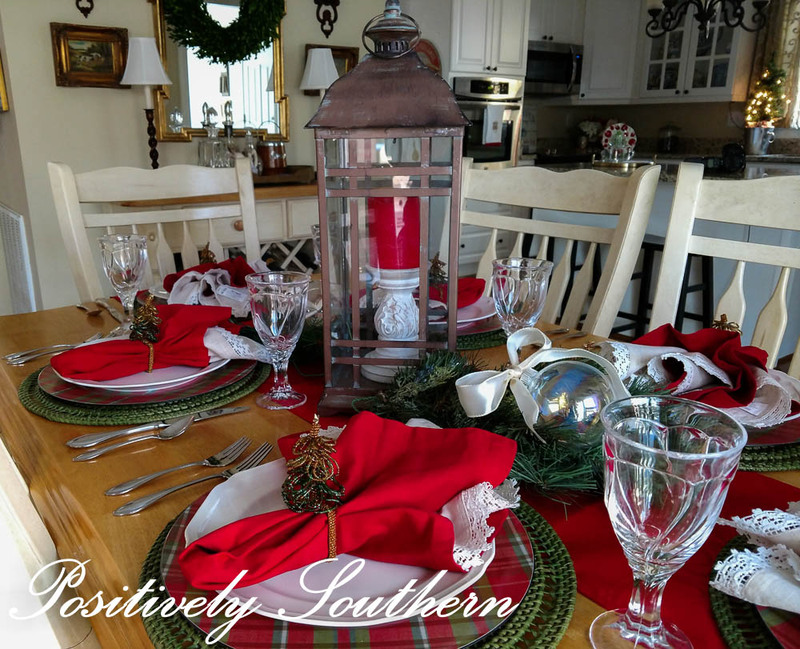 This year it is sporting those barley twist lamps, so glad I finally found these! Lots of red on my kitchen table! Tomorrow I'm sharing a post using these chargers on both my kitchen and dining tables. Mark your calendar for next Wednesday as we wrap up Merry & Bright's Holiday Home Tour. Today, be sure to stop by Confetti Style as she shares her amazing Christmas decor. 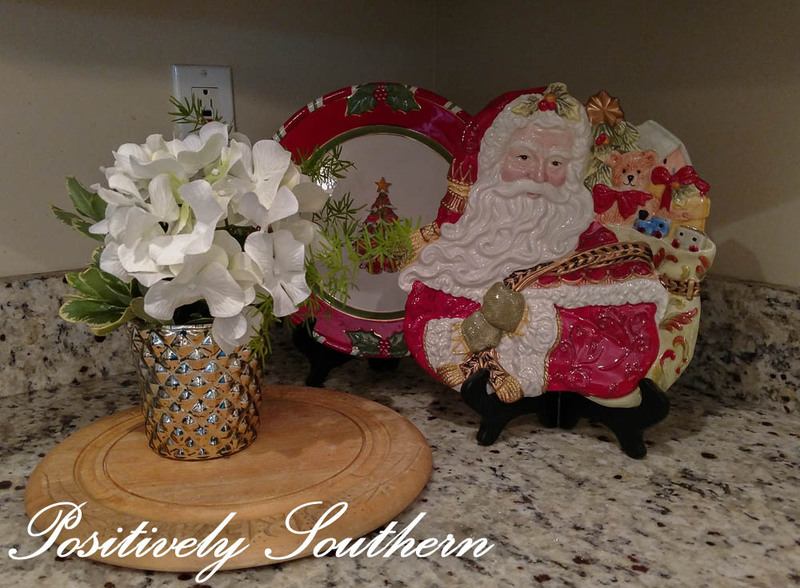 Shelly exudes fabulous decor in all that she does! Disclosure: While this post has sponsored elements the opinions are 100% my own!